When you start to add multiple types of plants to your backyard collection of vegetables and fruits, you need to know in-depth the little details that make the difference between a successful crop and a failed one. For example, the first thing to understand if you want to know how to plant sweet potatoes is that they prefer a warm environment. As opposed to regular ones, sweet potatoes are tropical plants sensitive to cold weather. As a result, many gardeners plant sweet potatoes just after a month from the last spring frost. This particular time of the year ensures that both the air as well as the soil become dependably warm. Also, the plants are able to produce vigorous vines that make for a great ground cover and keep the roots safe from chilly weather. The best environment for sweet potatoes to thrive in is a friable soil that contains a relatively equal mixture of silt and sand and a small proportion of clay. Hence, as opposed to other scenarios, the soil must not be too rich. At the same time, the planting area must benefit from a well-drained soil, so it does not hold too much water and consequently drown the roots. Another key factor when it comes to how to plant sweet potatoes is acidity. Hence, test the soil with a pH tester beforehand and look for pH levels that are anywhere between 5.8 and 6.2. However, if you benefit from a soil mixture highly acidic, rest assured as they can tolerate pH as low as 5.0 as well. Like any other soil preparation, you need to add into the mix proper plant food, compost, and fertilizers. Before the actual planting, mix a layer of compost, approximately one inch thick, into the soil and water until slightly moist. For the best results, you can top it off with bone meal, which is an ideal nutrient for sweet potatoes. It is possible that the soil is rich in clay. If this is the case for you, plant sweet potatoes in raised beds amended with sand and compost. Your crops will still yield in a soil heavy in clay but the potatoes will be thinner and sometimes oddly shaped as well. Whatever the case, if you are living in the northern hemisphere, it is a good idea to cover the soil or the garden beds with black fabric or black plastic in order to keep the heat trapped inside. Sweet potatoes are so easy to grow that in some cases sprouts that fall on the ground by accident take off on their own. However, this is possible only is the soil benefits from the right properties mentioned before, such as moisture and warmth. No matter if you go for planting sweet potatoes straight in the ground or in a raised bed, good development depends on the plant benefiting from plenty of airspace in the soil. Hence, start to plant sweet potatoes anywhere between 12 to 18 inches apart. At the same time, allow at least 3 feet between the rows. This way, the vines will have plenty of room to spread. If you plant sweet potatoes in a very hot weather, use an upturned flower pot to keep the plants safe from the scorching sun. After three or four days, you can remove the flower pot and allow the plant to develop further on its own. Work with plenty of compost and avoid fertilizers rich in nitrogen. Also, go for root sprouts as the sweet potato seedlings have a tendency of becoming root-bound, especially if you place them in containers. You can use a special technique to make yourself as many as 20 sweet potato root sprouts using a single individual. Using these, you will be able to grow an impressive crop and benefit from a plentiful harvest. Watch the educational tutorial on how to plant sweet potatoes and how to grow potato slips in order to understand better how easy it really is. Because sweet potatoes are a running type of plant the vines will cover a large area in a relatively short period of time. As a result, an important step in growing a successful crop is to avoid overcrowding. Hence, you can start to thoroughly weed the sweet potato plants only two weeks after planting. Pull the vines gently out of the ground while avoiding to dig deep with the hoe or any other tool for that matter. If you are not careful about this, it is possible to disturb the feeder roots that spread throughout the bed and consequently compromise the success of your harvest. 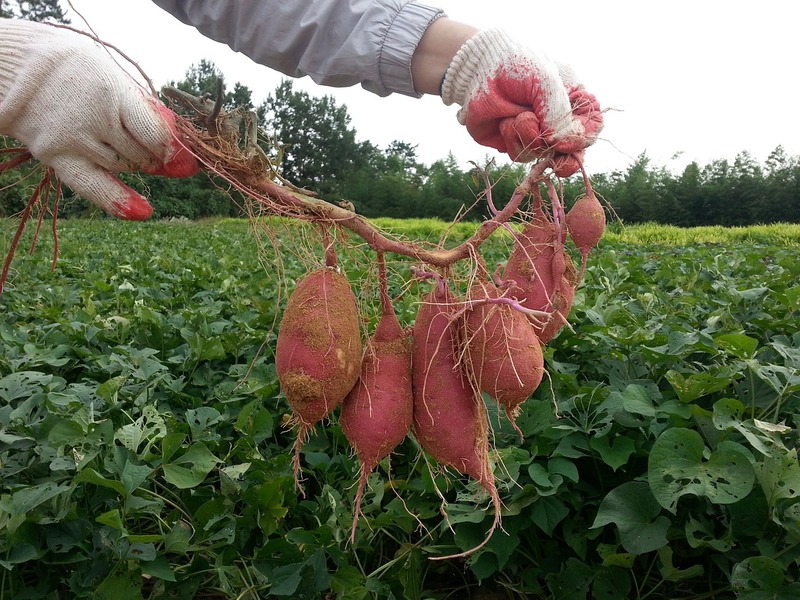 It is not necessary to water the sweet potato plants every day. However, make sure that you dampen the soil pretty good at least once a week. This is an important factor in the development of the plant, as the spreading roots need water to grow. Generally, sweet potatoes give off a decent harvest for a type of plant that thrives in an imperfect soil. However, in order to increase the odds of an impressive harvest, use fertilizers. Use specific plant food that is especially rich in potassium two weeks after planting. You can gently scratch it into the soil surface and mulch over the soil with a one-inch layer of grass clippings or any other biodegradable mulch for that reason. After one month you can continue to add more mulch and weed accordingly. Once you do this, the sweet potato plants can usually fend for themselves. If you experience some serious droughts, water the soil deeply every week and mix some liquid plant food into the soil as well. Apart from harmful insects, deer also like to feast on tender sweet potato leaves. Hence, consider deterring them with come floating row covers. Other flying pests such as the Japanese beetle or leaf-eating insects may cause some degree of damage to the plants. However, because the sweet potatoes plants develop at a fast pace and benefit from vigorous vines, they will usually outgrow foliage pest problems. The pests that aim for the tubers pose a more serious threat to your crops. In Florida and a number of other southern states, for example, you need to be particularly careful about potato weevils, nematodes, and wireworms. Insects are not the only thing you need to keep your sweet potato crops safe from. Scurf is a fungus disease that is extremely harmful to sweet potatoes. Unfortunately, this particular fungus infestation is soil-borne and impossible to get rid of once it takes up residence into the ground. The only way to prevent this is to plant disease-free sprouts or certified sweet potato slips. Usually, you can start harvesting sweet potatoes just as soon as the vines start to turn yellow. As far as the technique used for pulling out the potatoes from the ground goes, there are several factors to take into account so you do not cause extensive damage to the plant. First of all, locate the primary crown of the particular plant you want to dig. Using a digging fork, you can start loosening a wide circle of approximately 18 inches around the plant. It is now safe for you to pull up the crown and start picking the sweet potatoes. In order to make the harvesting process easier, you can clear some vines out of the way before digging by cutting them. Now that you know how to plant sweet potatoes, it is important to also know the right time to pick the harvest. Try to do it before the cooler temperatures start to set in. 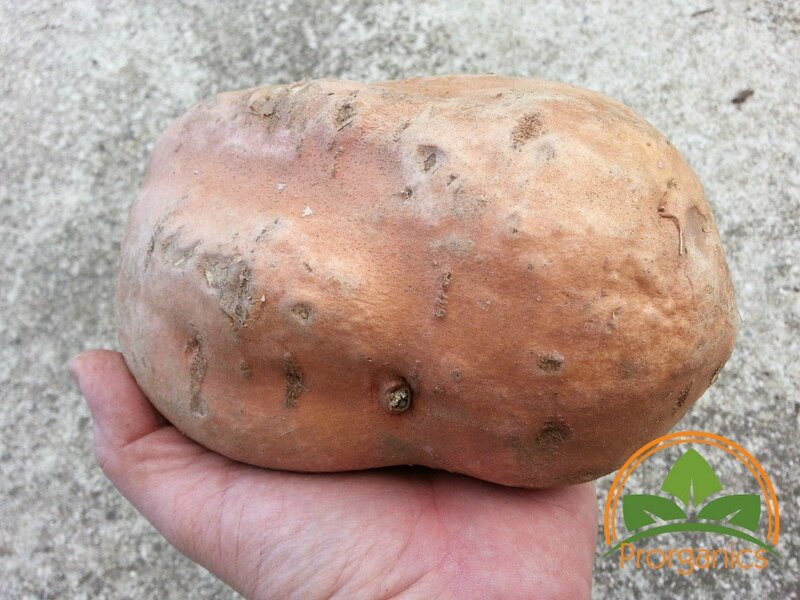 If you delay the harvesting, collecting the sweet potatoes too late will carry a negative impact on their quality as well as their ability to keep. In order to bring out the sweetness, they need a period to sit and cure. For this, you will need to shake off the soil and keep the unwashed sweet potatoes in a well-ventilated and warm space for about ten days. As the sweet potatoes start to cure, the flesh will become more nutritious and also sweeter. Keeping them in storage for a few days is very important as the fresh potatoes do not bake as well. After 10 days pass, you can move the sweet potatoes to a cooler location for safe keeping. However, do not refrigerate or store the harvest below 50 degrees. 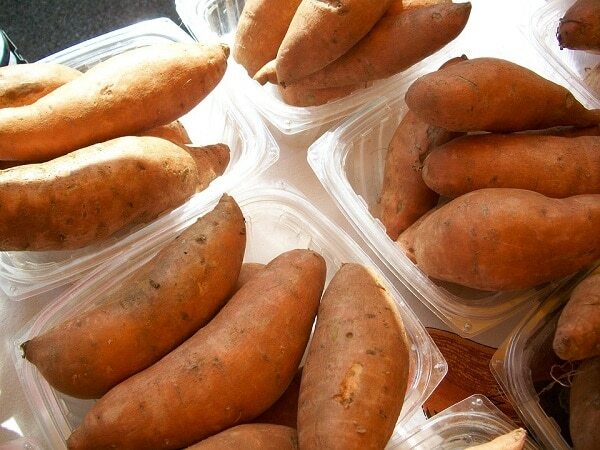 If you keep them in a basement at around 60 degrees, the cured sweet potatoes should keep well for up to six months. Also, be careful to set the humidity levels anywhere between 75% and 80% for the best results. Sweet potatoes are a great addition to any backyard garden. If you still have your doubts, refer to this article about how to plant sweet potatoes and learn everything you need to know about the planting process and taking care of your crops. The steps are easy to follow and the results couldn’t be tastier! As long as you pay attention to this step-by-step guide about how to plant sweet potatoes effectively and without much effort, you will be able to enjoy the sweet results in just a matter of weeks. Once you harvest the sweet vegetables, remember to store them in a proper place in order to enjoy them with your family or friends for longer periods of time.